Sparks Power supply power solutions to the event industry. Generator is also known as DG Sets On Hire / Hiring Services, Diesel Generators On Rental or Lease, Portable Diesel Gensets, Silent DG Sets, Diesel Engines. Majorly we serve our customers from cities like Pune, Bhosari, Pirangut, Chakan, Talegaon, Khed, Ranjangaon, Shikrapur, Sanaswadi, Shirwal, Solapur, Kolhapur, Ichalkaranji, Aurangabad, Ahmednagar, Karad, Sangli, Satara, Lonavala, Khopoli, Panvel, Nashik, Maharashtra etc. We provide power for any size function from a small back garden party through to large international events. We pride ourselves on the standard of equipment we supply and the level of service we offer. We are able to supply a complete power package from 10kVA to 1000kVA. 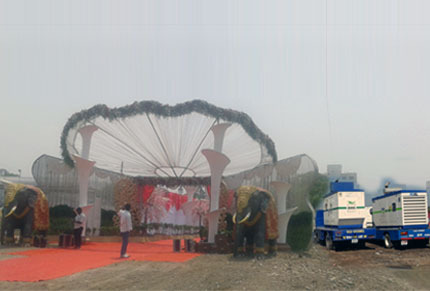 The event industry is our whole focus.Our generators can reduce your events CO2 emissions. Generator, Portable power and lighting solutions are needed at almost all outdoor events. Power Rental's service will provide you with machines that are maintained, monitored and fully tested.